Often, when analyzing bond yields, some of the world's most sophisticated investors - including former bond kings - make a surprisingly amateur mistake: they look at yields on nominal, unhedged terms which would not be a problem... if only offshore institutional managers who manage trillions and often are the marginal buyers of US debt, were interested in purchasing fixed income securities in another currency without having to hedge for currency impacts (spoiler alert: they do). The most notable example of this may be Bill Gross apocryphal bet that just because the yield spread between the 10Y US Treasury and German Bund was the widest it has been in decades, it will compress "just because." 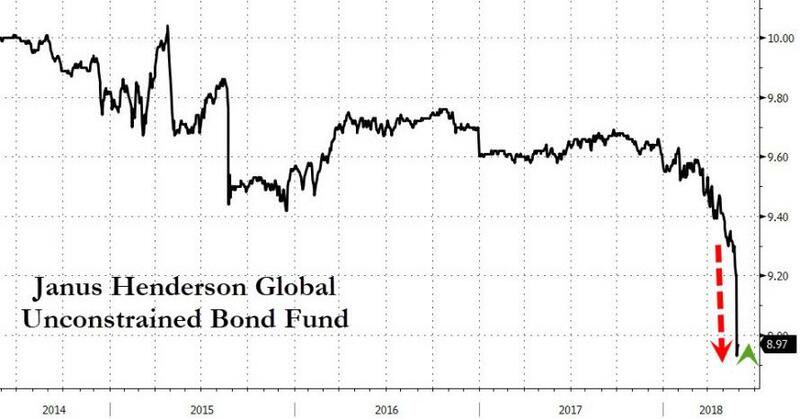 Alas, in late May 2018, precisely the opposite happened when a levered bet for Gross' Janus Unconstrained Fund imploded after the gap between US and German yields spiked further, resulting in massive losses for his investment vehicle. Bill Gross' investing acumen aside, if one shouldn't look at bond yields on an unhedged basis for an apples to apples comparison, what is the right way to analyze them? Well, on a hedged basis of course. 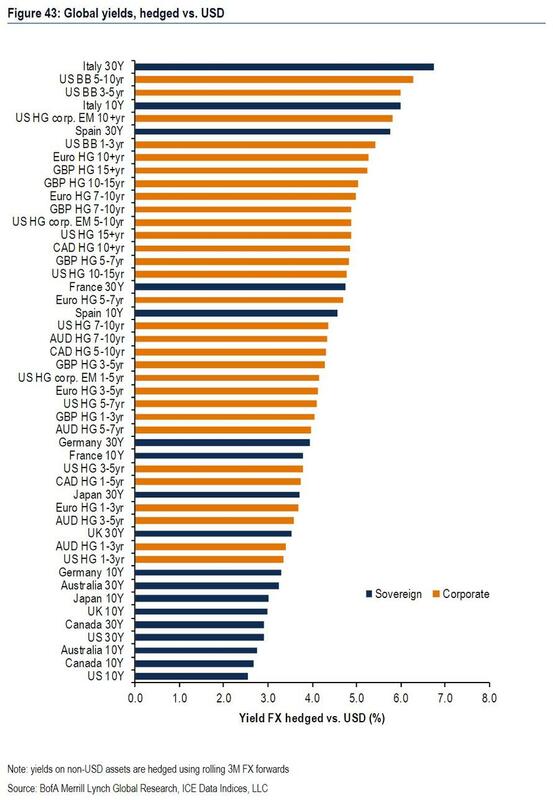 To help the world's financial "professionals' with any comparative yield analysis we present the following BofA chart, which shows yields from around the world, in both public and corporate markets, when hedged for USD exposure. What it shows is something rather surprising: in a world in which there is still approximately $8 trillion in negative yielding debt, the debt instrument which has the lowest, FX-adjusted yields is... the 10Y US Treasury! Perhaps just as surprising, the 4th lowest yielding hedged instrument, after Canadian and Australian benchmark bonds, is the 30Y US Treasury. There are not as many surprises on the opposite end, where French 30Y, Spanish 30Y and Italian 10Y and 30Y sovereign bonds comprise the tail end of the world's highest yielding fx-hedged instruments. Why is this a surprise? Because in addition to preventing painful, expensive lessons like the one which Bill Gross suffered last May, the chart above shows that, in a world in which the funding differentials are as vast as they are between the US and the rest of the world, should US funding needs continue to grow the rest of the world has plenty of other, higher yielding and FX-hedged options, than US Treasurys, suggesting that despite the recent flight to safety into US Treasurys, the sharp Treasury selloff which we saw in the late summer as the world's attention turned to US inflation and rising deficits, may return on very short notice to force yields to levels that offshore bond managers find attractive again. Unless, of course, Powell folds again and proceeds with QE4 in the very near future.